Seeing all the sheep in our islands’ green fields this time of year, do you ever wonder what sheep farmers do? I asked Dawn Ritchie, of Double R Bar Ranch on Lopez, who tends a flock of thirty-five Suffolk sheep on her land at the corner of Fisherman’s Bay and Davis Bay Roads, to tell me about raising sheep. As she talked, I was struck by how modest she is about what she accomplishes throughout the year from spring lambing through summer grazing to fall slaughter. She gives the sheep and her land more credit than her own skills. Others, though, like Lopez sheep farmer Kathryn Thomas and Blossom Organic Grocery owner Brian Kvistad, praise Dawn for raising beautiful sheep that produce high quality, grass-fed meat. We sat at her kitchen table overlooking the green field where the lambs would soon be born, and Dawn explained that she practices what’s called field lambing in which ewes lamb in the field. “I think they learn more lambing on their own.” she said. “Their instincts kick in.” She stays out of the way, helping out only for really difficult births. She also watches for two other threats—cold, wet weather and harassing ravens—but most of the newborn lambs are on their feet in an hour and butting their mother’s udder to start milk flowing. 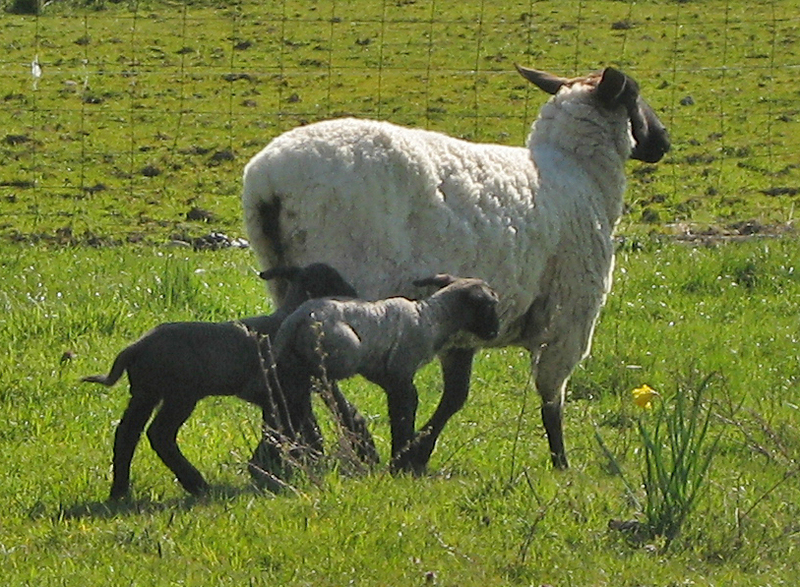 Over the summer, the lambs grow to about 130 pounds on grass and hay from Dawn’s fields. “They get to graze,” Dawn said. “That’s the key to these sheep doing well here. They have a great pasture and they don’t over graze.” By the end of the summer, these healthy, grass-fed lambs will dress out at 60-75 pounds. With all the darling lambs cavorting in the landscape right now, it’s seems cruel to think about lamb chops, but Suffolks are meat sheep and it’s for meat that Dawn raises them. She used the Islands Grown Farmers Cooperative Mobile Processing Unit twice this past year to provide lamb for Blossom. “My experience was fabulous,” she said. “They are great people to work with. The animals are killed quickly and humanely, and the carcasses are taken off island where they are aged and then cut, wrapped and frozen.” Finally, the tidy white packages appear in the freezer section at Blossom where they sell quickly. While I was still thinking about everything Dawn accomplishes in a year, including finding a new ram to add to her ewes in November, she wanted to talk about another topic: recycling all the plastic that she and other farmers use to wrap their hay. She’s working with WSU Extension, San Juan County Public Works, and Neil Hanson at Lopez Transfer and Recycle Center to set up a program for Lopez and other island farmers to recycle hay wrap as well as other agricultural plastics such as baling twine and nursery pots. So, while you’re admiring Dawn’s sheep or enjoying a lamb dinner, thank her also for taking on this recycling project.